The early demographic for the Switch was heavily skewed, with males accounting for 70% of the of the player base. Over time this has shifted over to an almost 50/50 split between males and females, much more in line with what you would expect from console player bases from the PS4 and Xbox One. In fact, the Switch skews slightly more towards females than either of the other two consoles, which have averaged a 55% male split. Ages for initial Switch owners skewed towards people in their mid-twenties to mid-thirties. Later, demographics would begin to skew both younger and older, suggesting that families and younger people (with little disposable income) were not as quick to adopt the platform right away. Worth noting, this 50/50 split has been achieved before Animal Crossing has even launched, so that female ratio should get even higher by year's end. 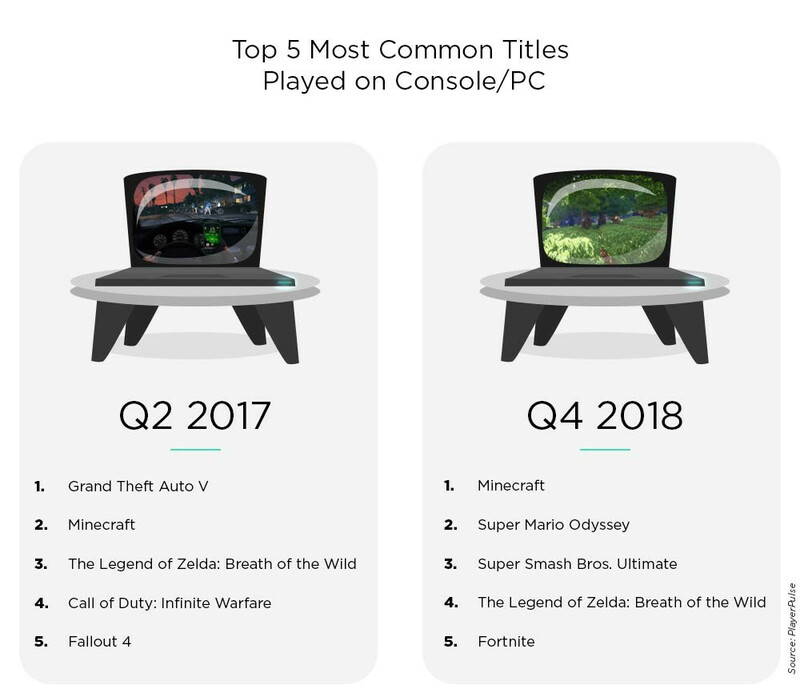 There's a lot more in the article including money spent on gaming and the top five games played by Nintendo Switch owners, well worth a read. Definitely has started to shift to more family friendly games! And this is before Animal Crossing. I wonder how fast that ratio evened out after a certain raccoon appeared at his desk. I don’t know what this post is insinuating but I’d like you to know it can easily be read as wanting to “snap” women out of gaming spaces. I read it that way, and I’m a man. Good on the Switch. I hope they continue to attract fans for a good amount of time to come. I’ve had nothing but positive experiences with my system, barring a few Joy Con oddities. ETA: I had a total Agahnim’s Hat/Head slash Black Omen Tower/Ship moment here where I got something in my head one way and needed additional possible context explained (thanks SuperFakerBros ), because I’ve largely only seen people use this picture/moment to depict wiping out half of (insert thing here). The other image with a knife, posted further down in this thread by Neoxon is the one I’ve seen used to depict “balance”. Wow at 35-44 more than 25-34. How does it insinuate this at all? 50-50 split in gender is actually very very good. Actually, it's even rare nowadays. I wondered if Xbox and PS4 have 50-50 gender ratio splits? Gee, I don’t know, because they’re neatly divided into halves and Thanos wanted to “snap” half away into nothingness? Like I said: The Wii generation is really putting in some work here. People who grew up with the Wii are finally coming back. This is great strides for more diversity in gaming though! The article says that they have XB1/PS4 at 55% male on average. Oh, I didn't know you were responding to that. I thought you meant OP., you should add the quote in your post. Even still, it's a very famous meme/reference to get what that meant. To an extent, but it's definitely not going nearly full wii demo and a lot more just people either getting into gaming recently or getting back into gaming/nintendo from before. I think we found the guy who hasn't seen Infinity War yet. We should probably be mindful of spoilers in here. Yeah, I deleted the image without putting a space or anything, so the forum ate the quote. That’s my bad. The image posted is during the actual “snap” event though. Or the part where’s he’s wistfully talking about doing it. I’ve only watched it once, but I think there are probably better images or memes to depict “balance”. No, I meant the trend from past years. Currently, it's 55 : 45 for Male:Female ratio, which is what the article is saying, but didn't mention the ratios from past years. EDIT: Oh, on average... Hmmm. Wow, this is an incredibly healthy demographics. Once Animal Crossing drops, even more women / girls will buy one. There’s a 55/45 ratio of male to female for PS4 and Xbox One? That seems hard to believe. Thanos derailing threads again lol. Back on topic. That's very even number. Wow! ssing drops, even more women / girls will buy one. Hence, I said it's a really rare sight to see. 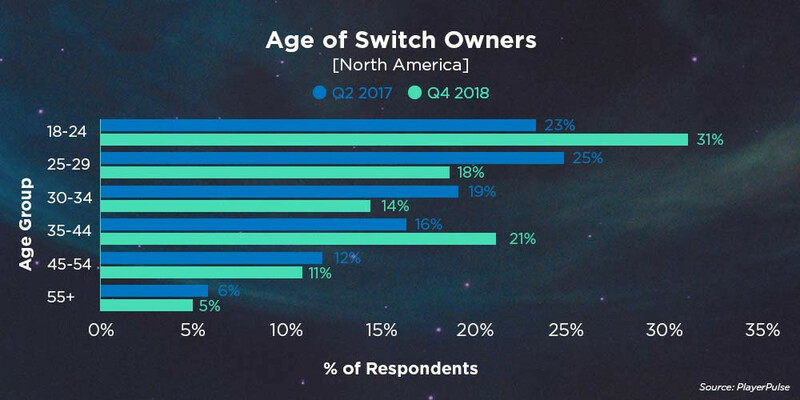 No, but the majority of the people who own the Switch, that 18-24 range. Those people were kids, and they were 5-11 years old when the Wii came out. For the younger portion of that demographic, the Wii was their first home console due to parents getting it because of the fad. However, the kids were likely the ones playing core Nintendo IPs, hence why the Switch is doing so well with that exact demographic. That Animal Crossing/Pokemon pull. Imagine when AC Switch/Gen 8 actually comes out. I refuse to believe that's what you thought that meant. I wasn't expecting the 18-24 range to be the highest. Owners under 18 aren't tracked? 18 to 24 is the new kiddie? Just kidding. Switch keeps winning. Well done Nintendo. Bringing games to all. That's really great. Now imagine on 2020 after Animal Crossing? Are these demographics for people who bought during the quarter, or what the total user base was like during that quarter. If it’s the latter I’m surprised it got to 50:50 so quickly. Not surprised with that 18-24 age demographic. The Wii/DS kids generation is powerful. Went from 80:20 (Nintendo IR PPT) to 70:30 (in OP) to 50:50 (in OP). LTD. But seriously, great job on the even gender ratio, Nintendo. Thank you. Good for Nintendo and the industry. Yo, dawg, I'm as pro-feminist and equality and progressive as I can get with a Y chromosome, but I think you're stretching things just a skooooooooooooosh here. Some people are just looking to be outraged. I'm honestly surprised the ratio became so balanced given 2018 release schedule. I'm glad we can now retire that one chart from like 2 weeks after launch that showed a heavy male lean that people were still using to argue that women don't play on Switch. This is extremely encouraging if true. I didn't think we'd see this kind of increase in the number of women until Animal Crossing. This, and finding out that apparently its 55/45 on the other consoles is comforting. 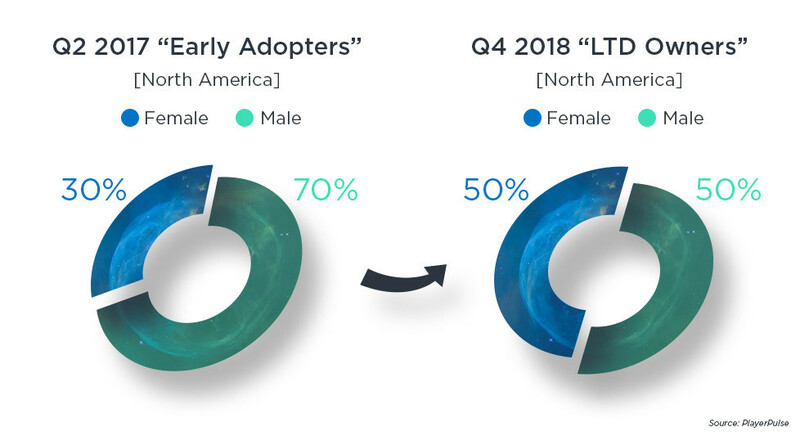 I'm waiting for a good translation of Nintendo's recent investor Q&A, because it had some incredibly interesting information about the gender composition of Nintendo's studios that should be discussed.